Here is another of our more unusual flower courses, the Chinese Peony, which is also known as the King of the flowers. In China this flower symbolises friendship, good luck and feminine beauty which is why it is such a lovely idea to use on Birthday, Mothers Day and Wedding cakes. With Karen as your tutor, you won’t need to bring any new equipment as she will show you how to craft the petals and leaves with tried and trusted techniques. First, hand crafting the petals of the Orchid which have delicate frilled edges. Next using how to use colour realistically choosing shades of lavender, pink, rose and cream. Karen will then show you how to make the stamen and finish by guiding you to assemble the flower . 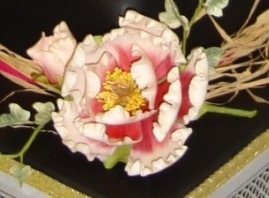 You will create a realistic Peony which can be used on a cake or given as a gift. A beautiful and thoughtful flower to make. Be the first to review “Chinese Peony” Click here to cancel reply.